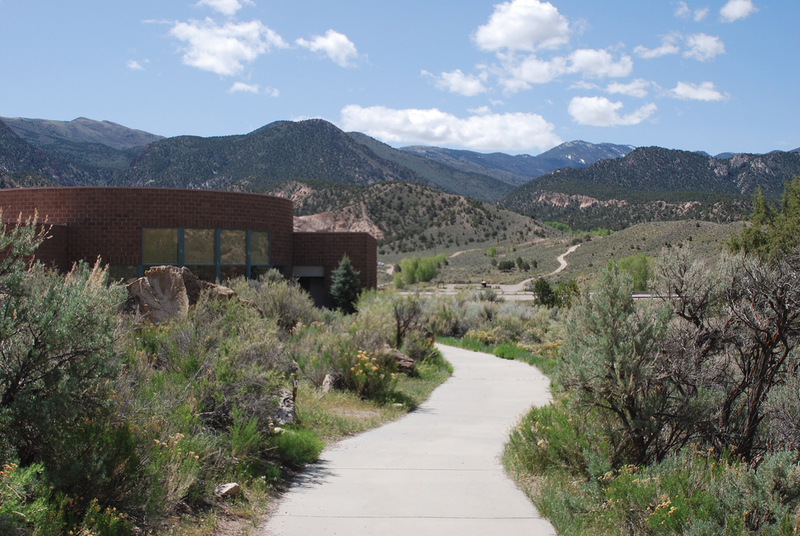 Fremont Indian State Park Museum. Low distant clouds lie over the Mount Belknap caldera. The Sevier River Formation forms the light-colored hills in the middle distance. Photo courtesy of Vandy Moore (Fremont Indian State Park). Fremont Indian State Park is named after a diverse group of people, the Fremont Indians, who lived in Utah from A.D. 400 to 1350. The park exists because of successful archaeological excavations in Clear Creek Canyon prior to construction of Interstate 70 between Richfield and Cove Fort, Utah. There are at least 10 Fremont sites within the park. In 1983 local elementary school students told Brigham Young University archaeologists that there were pottery shards and collapsed dwelling depressions on top of Five Finger Ridge. At the time bulldozers were removing the surficial deposits of Five Finger Ridge for use as highway fill. The archaeologists quickly recovered hundreds of artifacts from Five Finger Ridge; these and other Fremont artifacts are housed and displayed in the Fremont Indian State Park museum that opened in 1987. 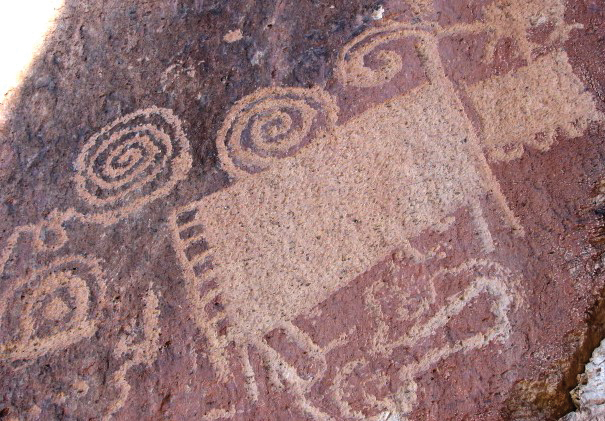 Clear Creek Canyon has afforded a human connection between the Colorado Plateau and Basin and Range areas since at least 12,000 B.C. The area has provided habitat or layover essentials for Paleoindians, Fremont Indians, more recent Native Americans, and Mormon pioneers. Interstate 70 is the latest human connection between Richfield and Cove Fort. How has the geology of Clear Creek Canyon contributed to the attraction of so many people over such a length of time? Clear Creek flows east to the Sevier River through the Clear Creek downwarp, a geological structure that began forming 27 million years ago. This downwarp helped form the passage between the formidable Pahvant Range to the north and Tushar Mountains to the south. 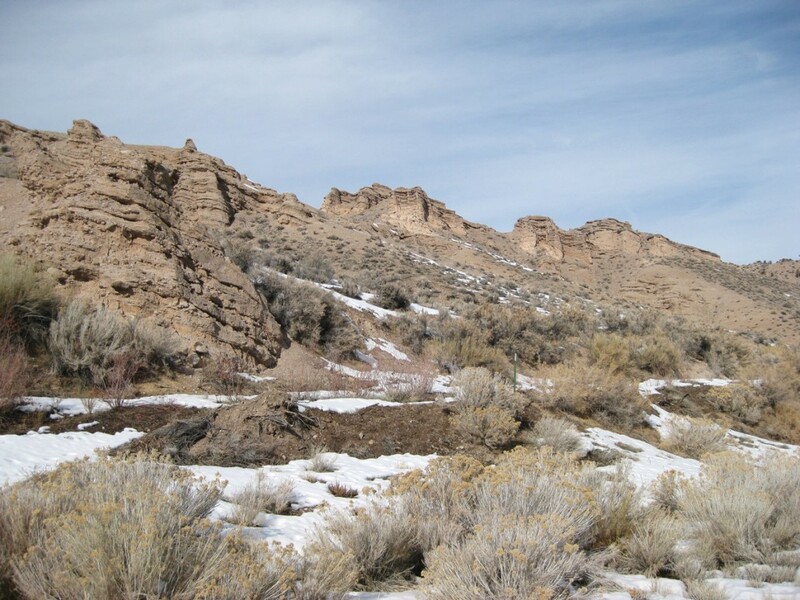 The oldest rock unit at the park is the 19-million-year-old Joe Lott Tuff, named after an early Mormon pioneer who settled in Clear Creek Canyon. The rock is a welded volcanic-ash avalanche deposit containing scattered pieces of rhyolite lava (ash-flow tuff) that was produced by an explosive volcanic eruption. The massive eruption created the Mount Belknap caldera located about 10 miles south of Clear Creek Canyon. The tuff is exposed in the high cliffs in the canyon. The surface of the originally white, pink, and gray tuff has weathered to darker colors and serves as a “blackboard” for Fremont Indian rock art. Overlying the Joe Lott Tuff, the Sevier River Formation consists of sandstones, siltstones, conglomerates, volcanic ashes, and lava flows that were deposited in lake basins, rivers, and alluvial fans between about 5 and 14 million years ago, when the present topography of the Basin and Range area began forming. The Sevier River Formation was uplifted and tilted around 5 million years ago. Where the Sevier River Formation is not capped by conglomerate, its sandstones and siltstones are easily eroded, and the resulting sediment has provided valley fill suitable for construction materials for buildings and for growing crops. Excellent exposures of the Sevier River Formation can be seen at the nearby Castle Rock Campground south of I-70 (see GeoSights article on Castle Rock Campground). Several years ago, local-area residents and amateur naturalists Jeff and Denise Roberts found fossils of two previously unknown species of tiny rodents related to modern deer and pocket mice in the Sevier River Formation near the mouth of Clear Creek Canyon. In addition to identifying new species, the finds are significant because mammal fossils dating to the time of the Sevier River Formation are exceedingly rare in Utah. Clear Creek tributary drainages, particularly Dry Creek and First Spring Hollow, provide sand and silt eroded from the Sevier River Formation and landslides in the Joe Lott Tuff for alluvial fans that extend into the canyon. The fan surfaces are good agricultural locations, and the tributary stream flow supplements the water supply in the canyon. 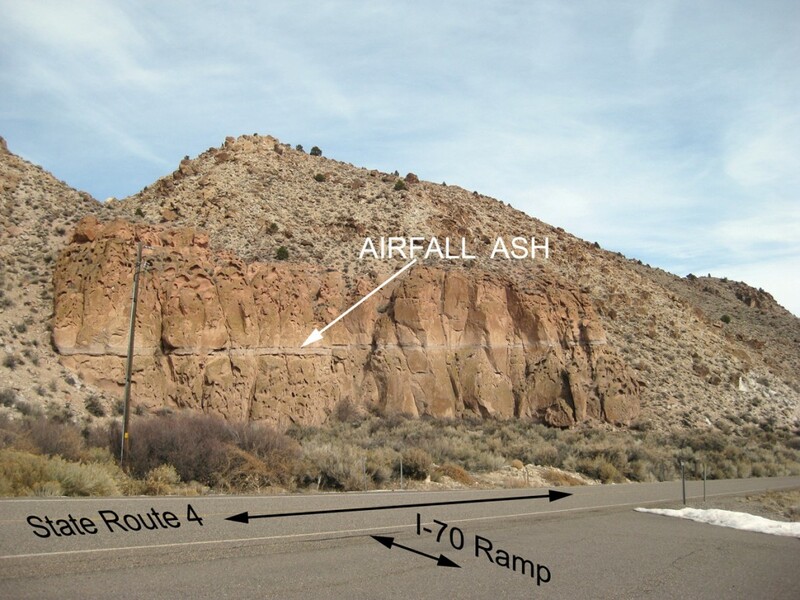 Fremont Indian State Park is on the north side of I-70. From the I-15/I-70 interchange south of Cove Fort in Millard County, head east on I-70 to exit 17. Exit 17 is about 20 miles southwest of Richfield in Sevier County. Follow the signs to Fremont Indian State Park. For more information, visitstateparks.utah.gov/parks/fremont.